Celebrate 25 Years Together With A Creative Silver Anniversary Gift--A Custom Handmade Portrait Painted From Your Photos. From graduations and the purchase of a home, to career accomplishments and the birth of children, a lot can happen in 25 years of life as a couple. 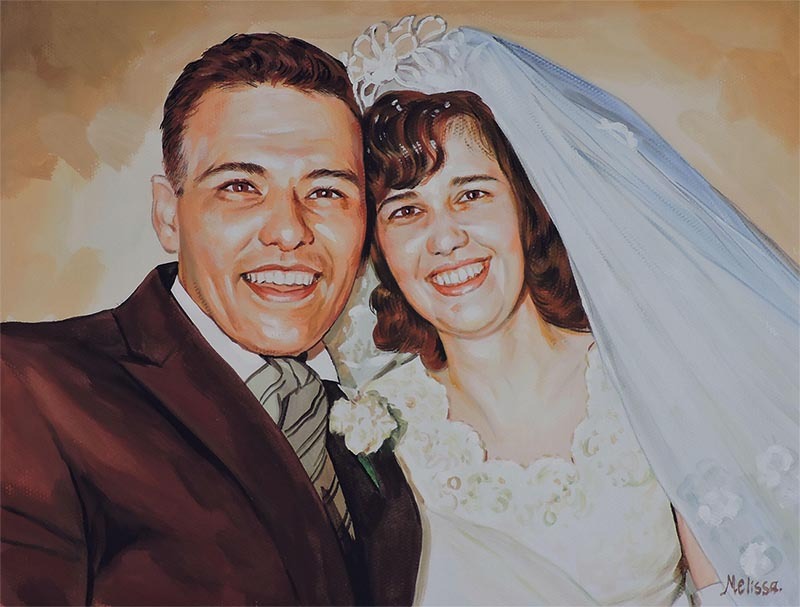 Give your loved one a silver anniversary gift that will never be forgotten--a custom hand painted portrait that brings to life a photo of your choice. 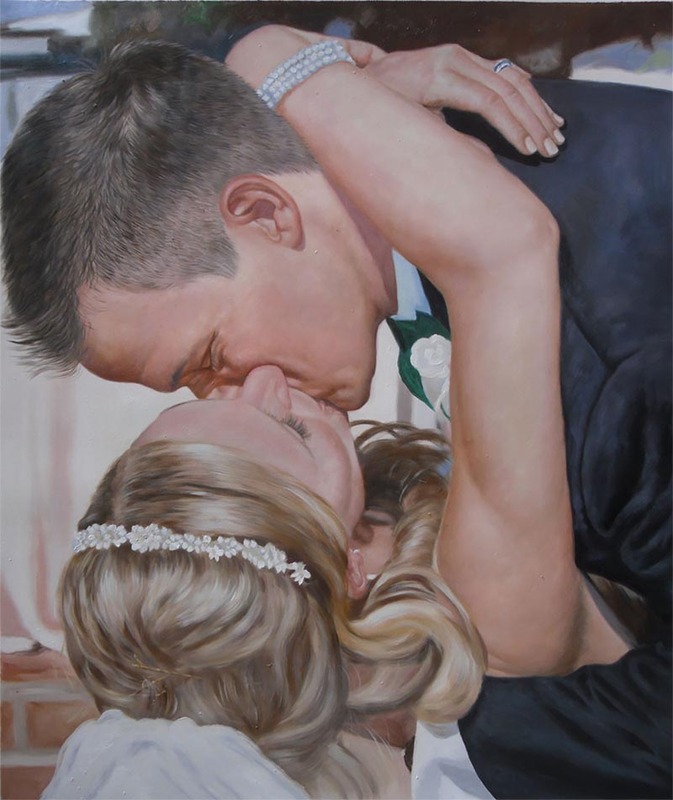 Browse the gallery below to select an artist, or leave it up to us to choose the perfect fit--we promise the end result will bring a smile to you and your loved one’s face on your special day. 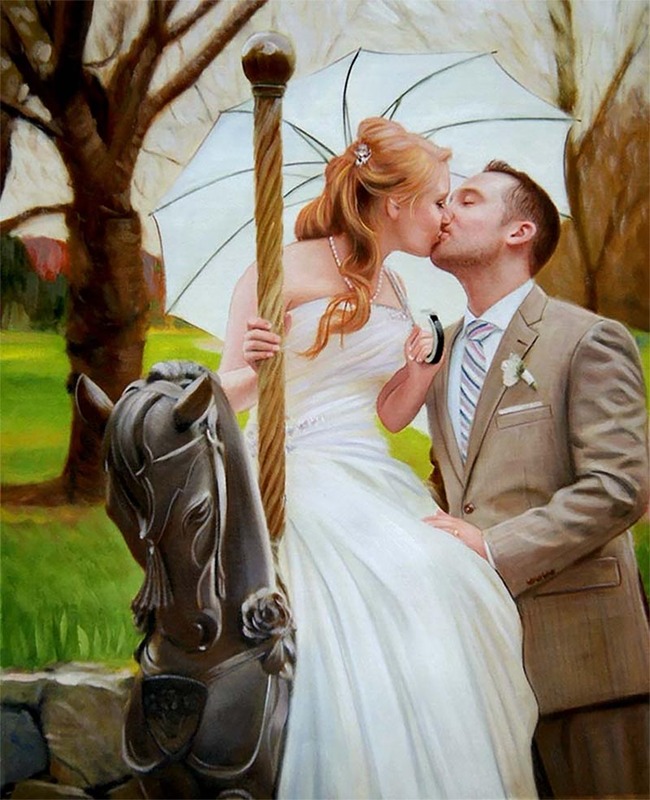 "The painting was a gift for my wife for our first wedding anniversary. I wanted to play on the traditional gift of paper and thought canvas and a painting would be a nice modern twist on the traditional gift. 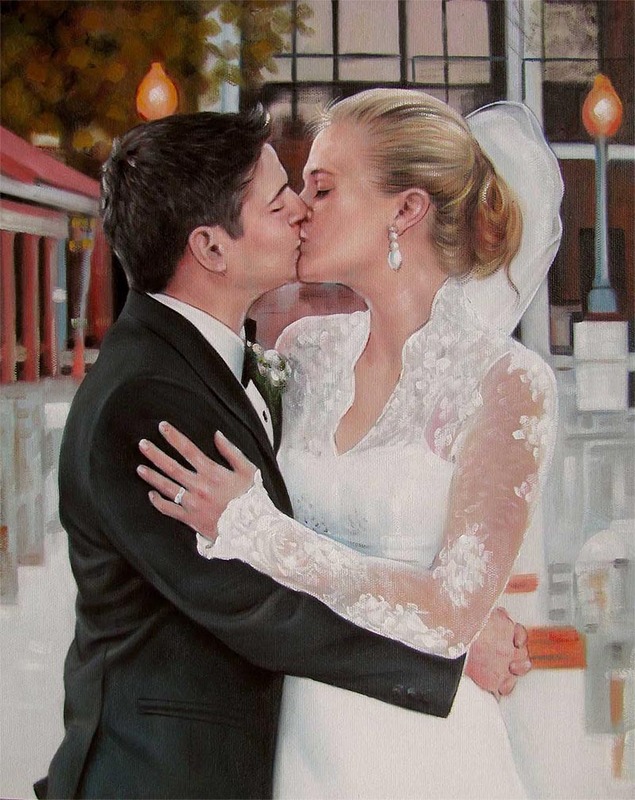 The painting depicts our wedding day and turned out to be my wife`s favorite photo from that day. She loved the painting and the way Paul the artist captured everything from that amazing day. " "I can not express my love for our beautiful painting done by PAINT YOUR LIFE! We received this beautiful piece as a wedding gift from our dear friend. This is by far the most sentimental and gorgeous gift we got. When I pulled away the packaging and saw the painting I began to cry. The artist did an amazing job and I couldn`t believe all the detail. Down to the buttons and detailing on the dress. This photo was taken with my train bustled and when I received our photographers photos I was bummed and I didn`t have many photos with the train down. My friend knew about my dismay and asked the artist to paint in the train. After she told me about all the great and thorough communication she had with the artist I was in awe! I will most certainly be using PAINT YOUR LIFE in the near future and will be recommended them to anyone looking for beautiful canvas paintings! Thank you for this amazing piece! It`s a beautiful statement in our home. ... "
Rated 5 out of 5 based on 197 reviews. Absolutely wonderful. Couldn’t have asked for better quality. Both of the portraits I commissioned ( in two different media) were gorgeous! Very pleased with this stunningly good portrait! Sheesh! That looks good it looks real. Very impressed with the overall product! The artist did a fabulous job, the painting looks just like the photo I sent them. The artist that did a excellent job in capturing all the details of the photo. Wonderful portrait, David did a phenomenal job!! My painting looks awesome. Thank you very much! Beautiful portraits!!!! They are exactly what I wanted and I couldn't be happier with them. Beautiful paintings of two landscape photos I supplied. Really like the painting. It was to our expectations. It was delivered on time. Thank you. Henry is awesome! I ordered two paintings from him and super pleased with the results. I was totally amazed at how 'life-like' the oil painting was that I received. I was extremely happy with the oil painting we received. Excellent. Wasn’t posted until completely happy. Jeff did excellent work, my paintings are perfect. Excellent job by the painter. Only complaint would be a few small splotches from paint that dripped off the brush, but you have to be looking for them up close to see them. Great portrait! Very realistic and flattering for those portrayed. Highly recommend. Just costly. Turned out perfectly. They did an excellent job on my panting. I got this as a wedding gift. I was more than pleased with the quality of the painting. The couple absolutely loved it ! I love my oil painting. I love that it’s done by a real artist. It looks just beautiful! My grandfather was killed at 37 yrs old over 50 years ago. All weve ever had were black and white photos of him. To see these turned into amazing quality paintings is breath taking and I’m so glad I took the chance to buy these. I can’t wait to have more painted! Amazing work!! Fast shipping and an amazing piece of artwork. The artist, Jeff created a perfect replication of my picture. great quality from our wedding picture. Simply awesome what else more can I say. My portrait came out exactly as I wanted. Would 100% recommend to anyone. I just received my third portrait this year. The quality of the work is outstanding and I am very pleased with my portraits and proudly display them in my home. The painting is amazing. Very well pleased. Will do this again. The paintings are beautiful in their detail. The artists are very talented. I highly recommend PaintYourLife.com to anyone. If you are on the fence about purchasing a painting for a gift, don't hesitate because you will not be disappointed and the recipient will be thrilled with their present. I was absolutely thrilled with my purchase. We were very satisfied with the result. Great service & a great job overall. The detail and precision of the product were beyond our expectations. I am very pleased and excited by the final product. It was a gift and very much appreciated. I wasn’t expecting as much as I got for the oil painting. Edit prework, approval request to begin painting. Ability to watch progress. Approval of final painting. Please see what I have written for "service." I didn't realize there was a second part. Excellent! The service is superb, the people are the best with customer service, the delivery is on point and the end results is beyond amazing!! Gorgeous pairing! Two photos were combined and it is lovely. Thank you so much! Extremely pleased with Melissa’s work. Another one being processed now. Planning another portrait shortly. Great painting. So realistic looking with real oil texture. Fantastic! Great looking painting we really enjoy it ! Best oil portrait! I would definitely have future painting done. Really great quality for the price. I was shocked how well it came together and how quickly. The first draft was almost perfect. With a couple of requested changes, the final painting turned out awesome and made mom tear up, in a good way. Painting says it all. Excellent craftsmanship. I received my painting in the stated timeframe and everyone absolutely loved it. I’ve never been more satisfied with an online purchase for anything. I’ve already recommended to many friends to try them out. Love Paint Your Life paintings! Stunning! Thrilled with the results!! Great value, excellent work and on time delivery! The portrait is awesome. My fiance and I love it. The artist did a wonderful job. It was so easy and the results were so far beyond what I expected. Will definitely get more works done. The portraits have been so “life like”. They do amazing work!! I suggested a revision and it was immediately applied. The overall quality was amazing and brought happy tears to my mother. Paint Your Life did an incredible job and was a pleasure to deal with. The process from start to finish was simple and the finished product was better than I imagined it would be. Highly recommend!! Extremely happy with the final result. Thank you so much!!! Superb service, painting looks much better than I expected. We have sent our second picture to be painted and are waiting on it. We have seen the progress and it looks as though it will be wonderful. Our 1st painting was of our son at an oil well fire in Texas. I could not have been more pleased. I truly recommend "Paint Your LIfe", to capture a treasured moment. The oil painting I received is absolutely beautiful! I would give more stars if I could..this company has excellent customer service and I will definately use them again! My painting turned out beautiful and my clients absolutely loved it! The total experience was absolutely perfect. From the pricing and the special Mother’s Day offer to the ease of ordering, and then most importantly from the first preview of the painting online to the actual receipt of the painting. It’s absolutely beautiful and flawless. An real treasure for the generations ! Thank you! loved our oil panting will order again! My wife cried when she saw the oil painting done. I couldn't be happier with the whole experience. Will continue to purchase more in future. loved my painting so much thank you! The painting turned out wonderful in taking from a photo to a oil painting words can not describe! Couldn’t have been happier with the final product. It brought tears to my wife’s eyes. It was a very special portrait, and know it will be cherished forever. This company commissions some of the bests artists that I’ve dealt with. They are superior! Gorgeous product, looks so realistic. Completely happy and satisfied with my picture. The painting was a replication of my Dad's 90th birthday. The artist was wonderful in taking my comments and updating the painting several times until it was right. The results brought tears to my eyes! It captured more than the likeness, it captured their personality and love. It was perfect. Thank you Johny! Excellent portrait! We were proud to give it as a gift! It turned out great! It looks so real. The artist took the photo I submitted and turned it into a reminder of a place and time that lifts my spirit.